Information is created in different formats and at varying times. The formats are usually dependent on the time in which the information is being produced. This process is sometimes called the Information Cycle or Timeline. 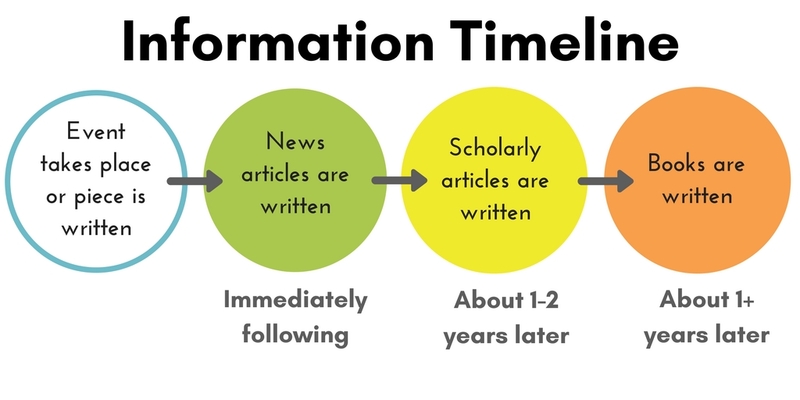 Some forms of information do not adhere to this timeline, but rather can be created or modified at any time (for example: social media posts or online encyclopedias). For more detailed information on these formats see the TRU (Thompson Rivers University) Libraries Information Cycle page. For more information about utilizing resources from different time periods see our Primary Sources box. We are indebted to the VIU (Vancouver Island University) Library Information Cycle page for some of this content. Use this to help you brainstorm a topic, connecting related ideas to a concept that interests you.